Yet Again A.Dd+ Find Themselves On Top. 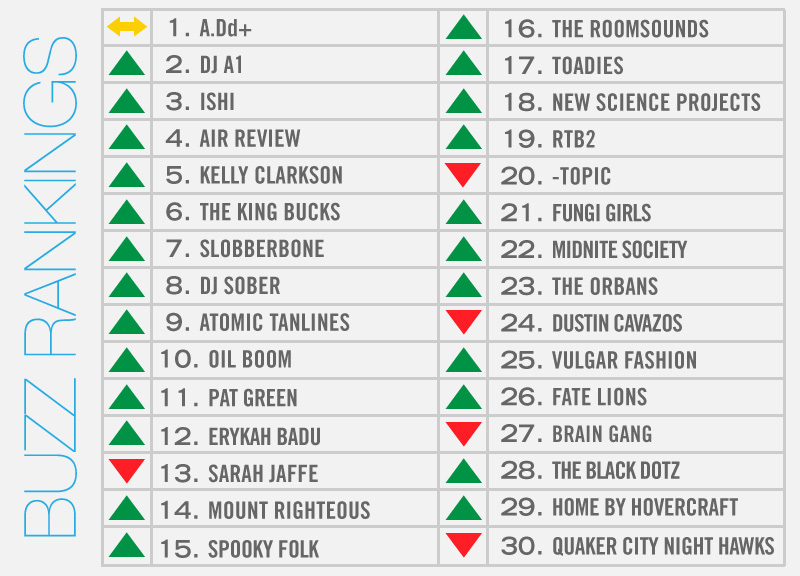 Since this weekly Buzz Rankings feature's inception, A.Dd+ has utterly dominated our rankings. So it makes sense that, during the week in which their long-awaited DiveHiFlyLo mixtape finally earns its release with a huge celebration over at Granada Theater, the trend would continue. And this week, at least, we weren't the only ones singing the duo's praises. Literally every outlet in town wrote glowing features on the pair in advance of Saturday night's show. Oh, and for good measure the duo also debuted a new music video for their NickNack-produced single, “Can't You See” via Red Bull USA's official website. A surprisingly close second to A.Dd+ this week, though, was DJ A1, who was recently crowned Dallas' best DJ following his crowd-pleasing performance at Red Bull's Thre3Style competition last weekend at It'll Do Club. Finishing second in that contest was the unofficial third member of A.Dd+, DJ Sober. Fittingly enough, he's the second-highest rated DJ in this week's rankings, too. Lower down on the list, Kelly Clarkson, Burleson native and winner of the inaugural season of American Idol, pops up after having had the distinct honor of being deemed inoffensive enough to sing “My Country 'Tis of Thee” for President Obama during his second inauguration ceremony. At this point, we can only postulate on the matter but we'd go as far to say that Ms. Clarkson very may have topped the rankings this week had she just committed the high treason of lip-synching like her fellow Texan Beyonce did during her “performance” of the national anthem. A few other acts around town have been catching all kinds of shine, too — albeit for their entrepreneurial efforts rather than their respective bands. King Buck/Calhoun bassist Danny Balis and Slobberbone guitarist Jess Barr are opening up a Deep Ellum spot call Twilite Lounge, and country singer/wave enthusiast Pat Green's The Rustic will bring a new 2,000-capacity venue to Uptown. Elsewhere, Ishi helped further christen the city's newest museum when they played a packed show at The Perot last weekend, Air Review celebrates their two-years-in-the-making album release with a show at Trees on Friday, Atomic Tanlines landed a slot opening for Ty Segall at Dada, and RTB2, Oil Boom, The Orbans, The Roomsounds and Fate Lions were all announced as openers at this year's KXT Summer Cut festival.